The epic Cedars article I was working on before being laid off was a piece loosely centered around next year’s tuition hike. 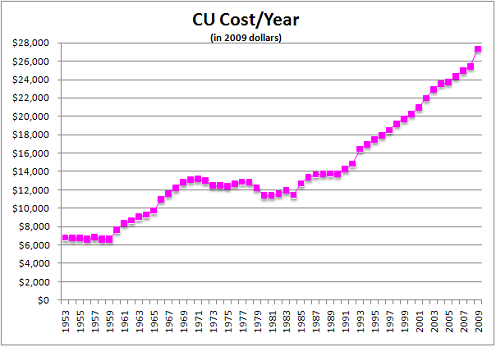 My task was to research CU’s finances to provide some context and do a comparative analysis with other similar schools. The project was about 85% completed when we got axed, so I’m going to use this blog as a platform to publish my research. This will likely be a multi-post series. In this first part, I want to simply show the average cost — an estimate CU publishes that includes tuition/room/board — since the school’s inception (adjusted for inflation of course).